In response to the challenges set by major initiatives such as Business in the Community’s Waste to Wealth Summit – launched today by the Prince of Wales – and the Government’s impending Waste and Resource Strategy, Futurebuild has announced that the Waste Zone will be returning with a number of new and expanded features for 2019. Curated by renowned architect and author of ‘The Re-Use Atlas: a designer’s guide towards a circular economy’, Duncan Baker-Brown, the Waste Zone will be the industry’s most comprehensive showcase of the latest innovations and thinking around the circular economy and sustainable waste management. 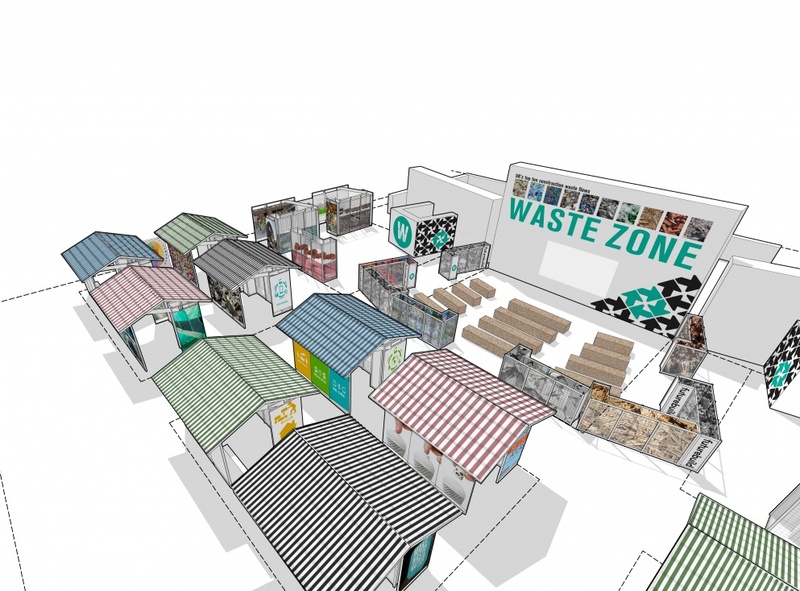 Central to the 2019 Waste Zone experience will be the new Circular Economy Hub, a dedicated marketplace for visitors to meet exhibiting brands to take a closer look at new and emerging materials, systems, and products that will enable the construction industry to join an emergent circular economy; demonstrating realistic, cost-effective solutions. The Hub will take a unique and exciting format, with vibrant stands taking the form of unique beach huts, developed and provided by the School of Architecture & Design at the University of Brighton and with a firm focus on ensuring zero waste. Exhibitors taking part in the Circular Economy Hub will be personally invited by Duncan Baker-Brown, or, for those with innovations who are looking to join the Hub, hand-picked from applications. The exhibition space will be complemented by the Waste Zone seminar programme – Waste Talk. Following on from the extraordinary success of the seminars in 2018 – which were oversubscribed by 40% – this year’s programme will be over 50% larger. Located beside the central ecobuild Conference Arena, the seminars will see over 25 industry-leading speakers address the challenges and opportunities a circular economy presents. The sessions will explore ways in which waste materials can be integrated into construction projects, how existing buildings can be deconstructed instead of demolished, and how new buildings can be designed as material stores for the future. The seminar space will be flanked by new foyer areas. These spill-out zones will showcase circular economy research, innovations and products from experts in the UK and Europe, including an exhibition on how waste can be a valuable resource for the construction industry, showing the re-use possibilities of the top ten construction waste streams. With the focus is on creating a truly waste free experience, Futurebuild is also calling out for Cradle to Cradle Certified™ suppliers to provide their support in bring the Waste Zone to life. The Waste Zone saw over 1,800 visitors at the 2018 event, and with an impressive line-up of leading designers, architects, waste managers, and material inventors from the UK, Europe, USA and Australia shaping up for the 2019 seminar sessions, even more visitors are expected to participate in talks for Futurebuild 2019. With limited places and the most engaged audience yet expected to attend, make sure you apply to be a part of the Waste Zone, visit: www.futurebuild.co.uk/wastezone-application.